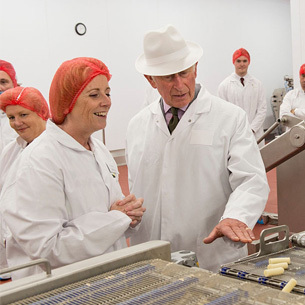 The HRH Prince of Wales opened our new £10m Abergavenny Fine Foods manufacturing plant today. Almost exactly one year ago the firms production facilities were completely destroyed by a fire. GWP worked alongside TSL Projects to deliver the new 6,300m2 plant for Abergavenny Fine Foods to allow them to continue production on site with minimal disruption. As part of his five-day tour of Wales, His Royal Highness officially opened the manufacturing plant and took part in a tour of the new production facilities. Opening the plaque, Prince Charles said: “It’s been a great joy for me to have a chance at visiting this newly created factory from the ashes of the old one. Abergavenny Fine Foods is a producer of specialist goats cheese products and frozen party foods, and supplies its products to some of the UK’s largest retailers including Tesco and Marks & Spencer.